Alloy Upgrade Radiator. Tig Welded Aluminium End Caps and a 42mm Core enabling a Higher Press..
Genuine Lotus Radiator Hose with Bleed Valve. Part Number A111K0007F. Will suit all Rover..
To Suit Lotus Elise or Exige with Rover K Series Engine. Part Number A111K6004F ..
OEM Header Tank Pressure Cap. To Suit Lotus Elise or Exige with Rover K Series Engine. &n..
Lotus Elise S3 S220 Charge Cooling Radiator A120K0043F. Brand new original item. 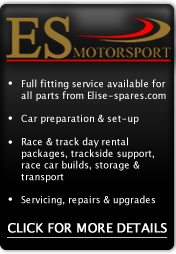 ..
Remanufactured radiator housing to suit Lotus Elise S1 or Exige S1 all models. Equivalent to&..